Ministry of Water Resources mowr Exam Notice 2018 has been published by the authority. Ministry of Water Resources mowr is one of the most important govt institutes in Bangladesh. 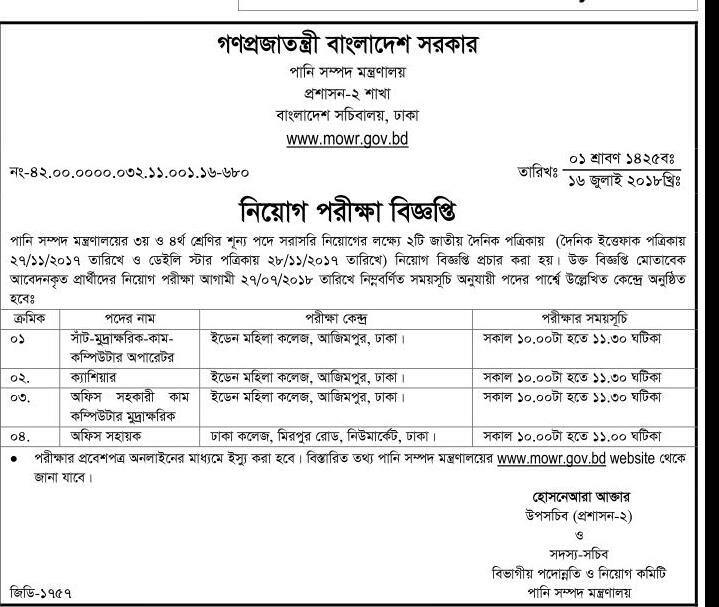 Ministry of Water Resources mowr published an attractive job circular. Then they also published the exam date & Admit Card Download Notice. And Finally mowr has been published exam notice. Ministry of Water Resources mowr all Job Exam notice & result 2018 will be published here in different times. Ministry of Water Resources mowr Exam Notice related all information, you can visit our website that is jobs.lekhaporabd.com. The Ministry of Water Resources is a development ministry. The Ministry has 4 wings namely Development Wing responsible for preparation, implementation and monitoring of the aided projects; Planning Wing responsible for processing of all projects for approval by the Planning Commission and preparation, implementation and monitoring of projects solely funded by GoB, and release of all funds of the development projects under ADP; Administrative Wing responsible for the administration of the Ministry and the organizations reporting to it; and Budget & Audit wing.Ministry of Water Resources mowr Exam Notice 2018 has been given below.